This is a recent photo update from our friend Pitchtanika Sanviset in Mukdahan province, which neighbors Yasothon province to the north and is across the Mekong River from Savannakhet, Laos. Pitchtanika, or P’ Ouang, has been studying with the “local wisemen” in Kudchum district, Yasothon, since the winter of 2010. A well-educated mother of two with a Journalism background in Bangkok, P’ Ouang has been hard at work turning her family’s land into a diverse, productive organic farm. Her commitment to her home community and work to promote organic farming with her neighbors and extended family is a model of how AAN famers make positive change from the ground up. P’ Ouang has also been carrying out participatory research with local farmers for her master’s degree, which focuses on the experiences of organic and conventional farmers. 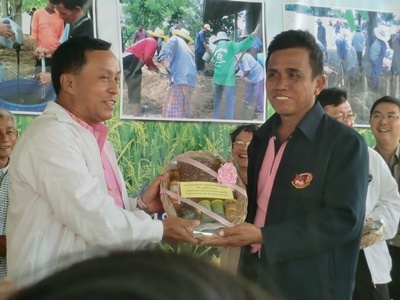 The photo above captures her recent rice harvest, a variety of red sticky rice which she received from Paw Bunsong Mathkao, AAN president. This year’s harvest will be eaten by her family and sold to friends. 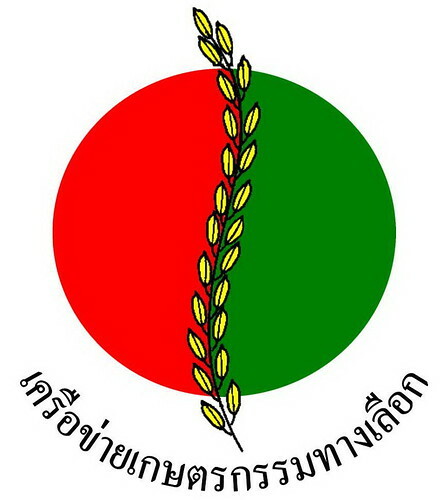 P’ Ouang also plans to plant Pa Keng rice next season, which she recieved from Paw Wan, another local wiseman in Yasothon province. This cross-provincial exchange of seed diversity is essential for it’s preservation and exchange. 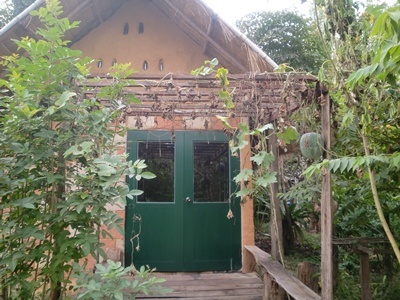 Below, P’ Ouang’s earthen home, which she built from rice straw and local, heavy clay soil. The home is a cool refuge from hot Esan weather. She has also planted various gourds in front of the house, which climb on the trellis in front. 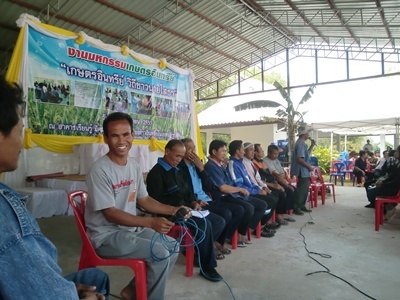 P’ Ouang recently attended an event in Non Yang village, Kudchum district, Yasothon province. Events like the one pictured below are becoming more and more common in this area, as organic farmers are being recognized for their success in producing high-quality, healthy foods, and receiving more support from government agencies to extend their efforts. The hangar building pictured below was built with a grant from the Land Reform Office (a division of the Ministry of Agriculture) and is used by the local wisemen to train organic farmers, store compost materials and mill organic rice in small batches. Paw Man Samsee, a farmer who has traveled to the U.S. to speak about his work to develop a Fair Trade certified rice cooperative in Kudchum, also spoke at the recent event. Alongside him and pictured below, is Paw Bunsong Mahtkao, AAN president. 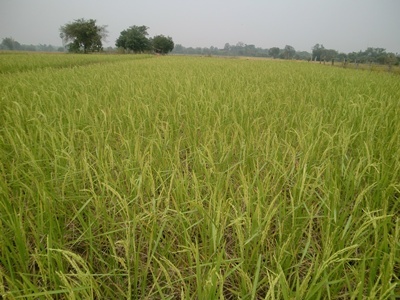 Both men work together to develop networks between small-scale organic rice producers and extend new organic techniques to local communities. For all of the field work that these farmers continue to put into their farms, both men are consistently speaking at public events or attending meetings to strengthen the organic movement in Esan. 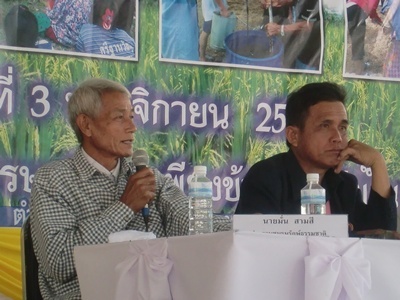 By learning from these farmers and others, P’ Ouang has been able to put together her own small community development effort in Mukdahan province. Her inspiration is clear as already accomplished so much within just 1 year. It is the AAN’s hope that more people like her return to their home communities and work for positive social and environmental change.